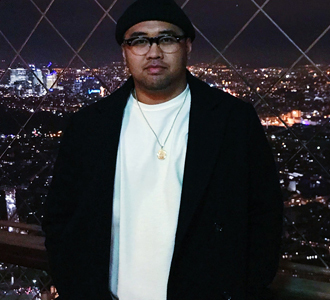 Joseph Thaddeus Alcedo said he made a very good decision when he specifically chose Salon Success Academy for his Barbering education. He did his research, considered all his options, and hasn’t looked back. Thaddeus was one of the first students to graduate from the Barbering program at Salon Success in Upland and he learned so much from Miss Liz that he knew he had to go back to her for Cosmetology instruction. She introduced him to the Sassoon proprietary methods of cutting. A Sassoon-trained cosmetologist and instructor, Miss Liz is a passionate educator and hair artist and Thaddeus feels lucky to have her as a teacher. According to Thaddeus, Salon Success is also one of the reasons he has such a growing number of clients. And although he’s super thankful for all he has learned and is still learning, he feels like this is all just a very important first step to his career goals. Miss Liz and the school “paved the way and gave me my first inspiration to ‘go for it,’” said Thaddeus. When speaking about what motivates him to work in the beauty industry, Thaddeus said it’s definitely not about money. Thaddeus is pretty passionate about what he does. What about you? If you’d like to learn from and beside people of passion, contact Salon Success Academy today. Fill out the form and we’ll tell you how to get started on a rewarding career helping others look and feel their beautiful best. What are you waiting for?